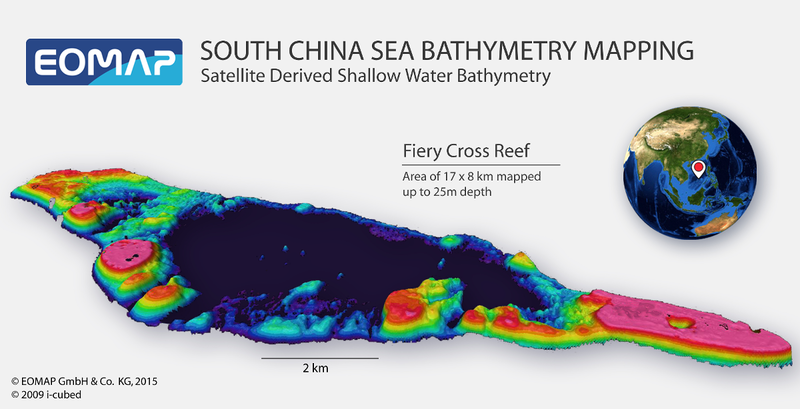 EOMAP Asia Pacific today launches the most up-to-date and detailed data set for the islands in South China Sea, generated by groundbreaking Satellite Derived Bathymetry techniques. The islands of the South China Sea are several hundred km away from the nearest coast and are surrounded by water deeper than 1000m, which is assumed to hold extensive of oil and gas reserves. The area is a disputed territory of several countries within the Asian region. Data about the underwater topography are outdated or not accessible. Instead of relying on acoustic or airborne methods to map the over 250 islands, atolls, cays, shoals, reefs and sandbanks, EOMAP used satellite image technologies, a rapid and cost effective solution. With EOMAP having mapped the Great Barrier Reef of Australia, the Mexican Riviera Maya and the Persian Gulf this is the next big step towards an increasing and updated bathymetric database, which is offered to commercial and governmental clients both alike. The data are available in a 15m bathymetric grid and on request in a 2m or even sub meter grid using the most recent satellite imagery. With the clear water conditions of the South China Sea water depth up to the 25m contour line could be mapped. This is actually the depth range which is of particular importance for navigation. EOMAP is the world leader in aquatic remote sensing services, notably using optical sensors to derive bathymetry, seafloor and water quality products. Pioneering in the field of satellite-derived high resolution water quality and bathymetry, EOMAP solutions rely on standardized physical models which are independent of scale, sensor type, and geographic location. EOMAP has received several awards from the COPERNICUS program of the European Commission and ESA (European Space Agency) for its work on making affordable aquatic remote sensing products for industry and the public sector.